I realized that in the past few months I have been self-indulgent with my APP-smashing. APP-smashing is something that is very easy to self-indulge in. In my current role I have many ed tech hats. One of those hats is a teacher of teachers and a creator of iPad Professional Development courses. Since I use iTunes U as my platform it is very easy to create teacher tutorials for the course in Tellgami+ Green Screen + iMovie + Explain Everything – especially when there are so many cool adult APP-smashes floating around on-line. I mean I could lose half of a snow day making an APP-smash tutorial. However, the reason I love APP-smashing is not because of what I can do with multiple APPS but rather because of what my students can do with multiple APPS to show me what they have learned. My most important ed tech job is being a high school teacher. 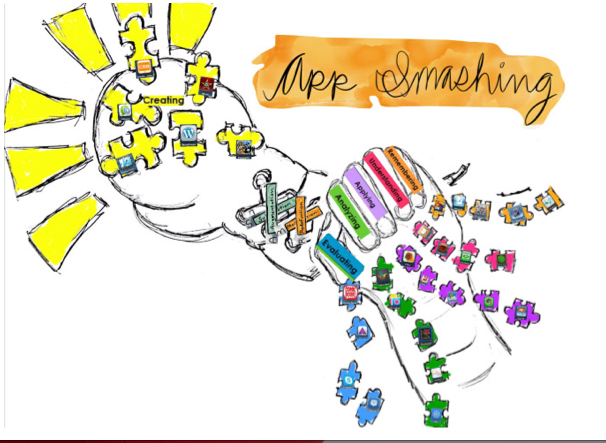 When I attended Gregory Kulowiec’s APP-smashing presentation at the recent iPad Summit in Boston, Greg addressed that there is a lack of published student APP-smashes online. So I say to everyone out there – the kids are alright – let them APP_smash!! This past week I began an APP-smash project in my forensic science class. I had the students review the essential questions and enduring understandings related to the course in iTunes U. Then I told them the learning goal of the APP-smash was for them to work in pairs and “synthesize the big ideas of the course in the first marking period.” Once we established the learning goal I told them their only restriction was that they had to use more than one APP in their final presentation/product. I gave them some minor suggestions but they were really able to take charge of their own learning which shows how APP-smashing drives student empowerment. Don’t you think Howard Gardner would do a jig if he hears about this? See how students are able to create amazing APP-smashes that capitalize upon their talents and strengths as learners. I promise to publish this student work once we have our APP-smash contest next Tuesday. I would like to maybe start a collaborative course in iTunes U where many of us bundle our student generated APP-smashes. This is such good stuff that we can’t afford to keep it a secret within the four walls of our classroom anymore.